Miron specializes in providing innovative pre-construction, construction management, design-build, general construction and industrial services. McMAHON provides full-service engineering and architectural services to public and private-sector clients. We are driven by a service-oriented philosophy to achieve client satisfaction on every project. The WI Sustainable Business Council is a network of Wisconsin businesses and organizations that are interested in, or actively responding to, the challenge of sustainability. Ten thousand of environmentally minded business professionals, 500+ News outlets and reporters, and even a treehugger or two now read WDNGreen each week. Thank you! Ideas for Consideration - Please forward, share and discuss! Work with developers, architects, communities, and business to ensure the highest and most cost effective Green building practices are used in new development. Expedite projects who guarantee the best environmental practices and make sure the systems are in place to ensure this. Trust but Verify. Avoid costly mandates and restrictions that will move businesses to other states or regions. Work with counties to create and enforce new mining regulations, restrictions and enforcement. Delay approval of any new mines until counties have their regulation policies in place. Restore DNR environmental staff and expertise to levels that can review any requests in a timely manner. Require a site reclamation fund be established from the onset of any approved project with a plan in place for complete site reclamation. Allow municipalities to enact special utilities in lieu of or in addition to regular taxes for issues like impact on roads, utilities, infrastructure, and public safety. Work with the utilities, business and communities to encourage the use of renewables, reduced carbon output, and better reporting and measurement. Establish a PSC willing to work with business and power companies while progressing to a lower carbon renewable future. Do not impose legislative mandates on renewables but rather incentivize use of new technologies while maintaining an open dialogue among all parties involved. Become a strong partner in Great Lakes–St. Lawrence River Basin Water Resources Compact. If water is removed from the watershed, require that it be returned cleaner that it was taken. Again make sure DNR has the resources to monitor and ensure this policy. Require the need and or profit for new systems to Wisconsin citizens. If a system like tar sand or electricity is for other states or regions, require that the land uses benefits all citizens in our state in lower utility costs, additions public facilities and reduced air and water pollution. Require that any new system create an environmental offset equal to or greater than the land they take. This can be done in two ways: One additional Parks, Public Lands, Trails, Access to Waterways, Etc. OR Two reduced carbon emissions through the elimination or older less efficient production facilities or the conversion to renewable or exponentially lower emission fuels. Address and regulate CAFO`s like the "cities" that they are. Develop regulations and controls to address the scale of effluent that these facilities produce. Consider using CAFO`s as a model for new waste treatment like digestion and pasteurization. Preserve the small farm in Wisconsin by encouraging sound environmental practices in a cost effective way. Work with all farms, businesses, and communities to improve watersheds, runoff and source point pollution focusing on results rather that penalties or mandates. Improve our transit and shipping corridors like rail and interstate access to encourage Wisconsin to become an efficient distribution hub for the Midwest. Encourage communities to adopt new and more efficient mass transit systems. Encourage the use of more efficient buses, trucks and vehicles in the state. Explore ECO Tourism as an option to preserve our vast agricultural heritage and natural waterways and woodlands. Allow ECO TIF financing to pair tourism development with land and watershed preservation. Ken Notes: Just a few ideas, please feel free to pick and choose then share with those on both sides of the isle that will be making decisions. We now have an opportunity to grab the pendulum in the middle and make a real long term difference in how we manage our resources and what kind of Wisconsin we leave to our grandchildren! These are personal viewpoints shaped by your feedback. They are not the positions of my sponsors or partners. Coverage of local and national eco news for commercial development, home, transportation, food and community. We search for environmentally friendly news that makes economic sense for Wisconsin. ONLINE HERE. Please share with a friend. To receive WDNews GREEN on Monday of each week as an email you must subscribe - secure link to subscribe is here. We may now need to build a coalition that is willing to lobby from a "greener" yet pro business perspective. Lots of HUGE issues: Sand Mining, CNG, LEED Alternatives, Focus On Energy, LED Lighting R&D, Cleaner Power Generation, Recycling, Power Lines, Electric Cars, Wind, Solar, Bio Fuels, Digestors, Green AG, Business Incentives...And of course the Greenest and Happiest of Holidays to you! 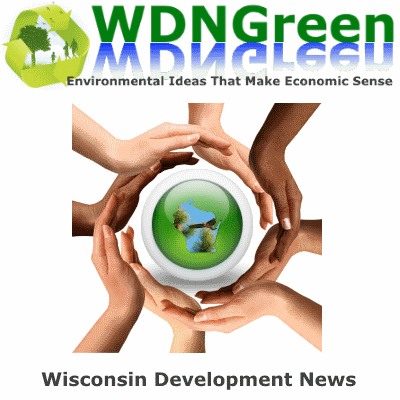 WDNews GREEN will be emailed on Mondays, included in WDNews on Thursdays, and online all the time at: WDNGreen.com Each week we will find 10 to 20 articles from Wisconsin and across the Nation dealing with environmental issues. Our goal is to promote environmental excellence from a sound business perspective. Ken Notes: Please forward this to friends and colleagues who have an interest in our economy and environment. You may eMail Me Here.